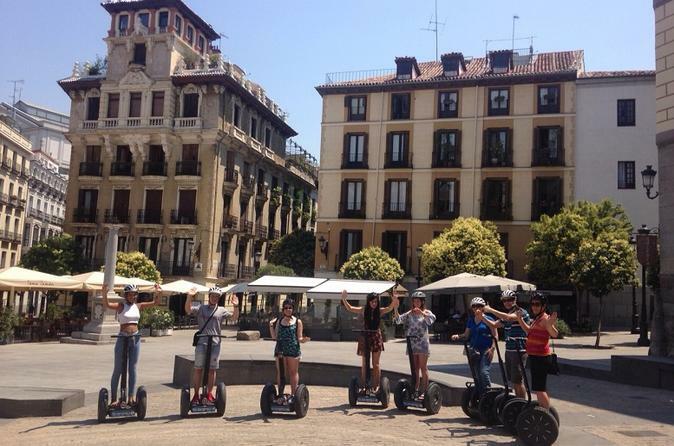 Join our amazing Segway Tour and explore the most important tourist attractions in Madrid City Center, from the the Almudena Cathedral to the Palacio Real, from the old Egyptian Templo de Debod to Casa de Campo Park. Do not miss your chance to join us! Enjoy a 3 hours Segway Tour with us. And your memories will be incredibles! The tour starts from the Plaza San Miguel, just in front of the main entrance of the San Miguel Market, the most popular market in Madrid, that was originally built in 1916. It is an high quality gourmet tapas market, with over 30 different vendors selling fresh and delicious tapas. Then it goes on exploring the most important sites in the City Center, like the Plaza de la Villa, one of the oldest square with its incredible buildings from 15th, 16th and 17th century. The oldest one, La torre de los Lujanes, it was the residence of the famous music composer Federico Chueca. Afterwards, The Plaza de Armeria is our next destination. The Royal Palace with its 3,418 rooms and the Almudena Cathedral are waiting for you! And riding the segway will be the coolest way to get all those sites. On the way to the Egyptian Templo de Debod we get the Orient Square and the Sabatini Garden, the last one it is pretty similar to the Versailles Garden in Paris. One of our last destinations after exploring Madrid Rio River Park is the Casa de Campo Park, it gets its name 'Country House' because it was once a royal hunting estate. The Park is absolutely fantastic, taking up an area of 1,750 hectares. In addition, the views that we get are marvelous and breathtaking.